Most people cannot fully appreciate their healthy smiles until they’re gone! Tooth loss is a common result of gum disease, physical trauma, or aging. The good news is that if you have lost your teeth, the perfect solution is waiting for you at our practice. Patients love our implant-supported dentures because they restore their abilities to eat and speak. Our dentures are also highly appealing and natural-looking. They give patients the confidence to smile and laugh again. Come in for a consultation with Dr. Williamson to discuss your tooth replacement options. If you decide that implant-supported dentures are right for you, she will plan your treatment process. Implant-supported dentures use a series of placed implants to secure your dentures. If you choose All-on-4 dental implants, we will use four strategically-placed implants. 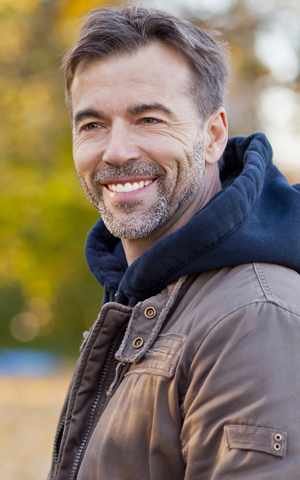 All-on-4 dental implants are popular for patients who are missing teeth because they are economical and allow your dentist to secure your dentures in fewer appointments. Denture patients should never hesitate to give us a call with questions or concerns. We are always happy to bring our patients in for denture adjustments when necessary. Implant-supported dentures are also called permanent dentures. Dr. Williamson is proud to provide permanent dentures to her patients who want a long-lasting and comfortable denture solution. Permanent dentures are held in place by denture implants, which are titanium replacement roots that are installed beneath the gums. Permanent dentures will never slip, slide, or fall out of place while you wear them. Best of all, they provide added support to your jawbone and can help prevent bone deterioration. All-on-4 dental implants use four implants to hold your dentures in place. Some patients have been able to enjoy a full new smile after just one appointment with All-on-4. To find out whether permanent dentures or All-on-4 dental implants is the best solution for you, talk to your dentist. Want to enjoy the benefits of a happy and healthy smile again? Please give us a call today to schedule your denture consultation.